Here’s how it played out when one of the Mondragón cooperatives fell on hard times. The worker/owners and the managers met to review their options. After three days of meetings, the worker/owners agreed that 20 percent of the workforce would leave their jobs for a year, during which they would continue to receive 80 percent of their pay and, if they wished, free training for other work. This group would be chosen by lottery, and if the company was still in trouble a year later, the first group would return to work and a second would take a year off. –often by sacrificing their jobs – that is not true at Mondragon, which acts as the parent company to 111 co-ops. 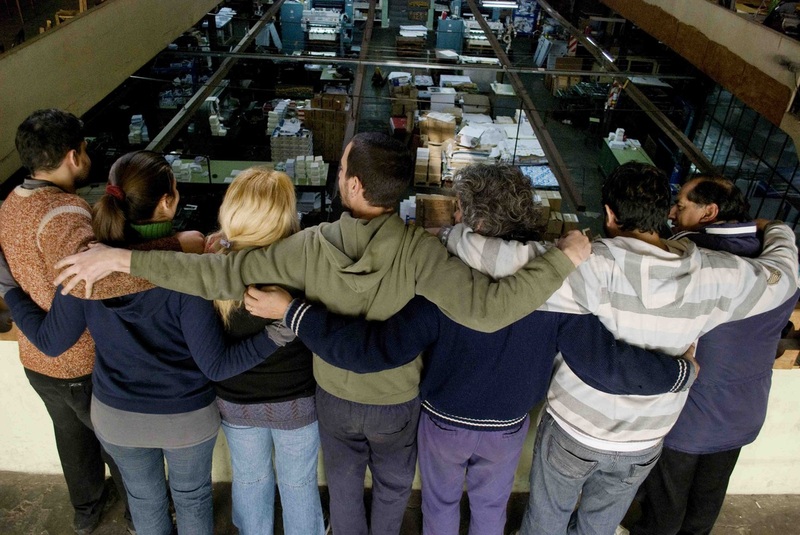 The central importance of workers permeates every aspect of the Mondragón, both a corporation and federation of worker cooperatives. Even though the MCC businesses are affected by the global financial crisis, there is no unemployment within the MCC businesses. People are moved around to other jobs, or hours are cut without cutting pay. The wages for unworked hours are to be repaid through extra hours worked later in the year. Founded in the town of Mondragón in 1956 by Father Jose Maria Arizmendiarrieta, a Basque Catholic priest, the Mondragón cooperatives today comprise more than 100 cooperatives, as well as more than 100 subsidiaries that MCC has purchased and hopes to convert. Altogether, MCC companies employ more than 100,000 worker/owners and in 2007 generated revenues of more than $24 billion. This empire of egalitarianism grew from humble roots. Father Jose Maria brought together the residents of this Basque community through study circles and workshops. His aim was to confront high levels of unemployment that kept the region in poverty and isolation. The philosophy that emerged from those meetings put the rights and well-being of workers first, with growth mainly aimed at providing additional jobs and job security to employees. At the same time, the MCC has never lost sight of the fact that it can’t generate high-quality well-paying jobs without innovation and creativity. To that end, MCC managers in 1981 founded Saiolan, an incubator program that aims to create new companies and products by bringing together would-be entrepreneurs with identified needs, and helping them out with feasibility studies and prototypes. The result has been rates of innovation that challenge those of the world’s most successful corporations. A Mondragón firm manufactured Spain’s first computer chips, for example. Others are producing wind, solar and hydrogen power. New business opportunities in health and food, communications and alternative energy are now being researched, as well as shared housing for elders and furniture convenient for older people. Saiolan also offers budding entrepreneurs coaching, technical resources, funding and help with business plans. To date, it has helped 285 entrepreneurs create their own companies and many others to develop their ideas within existing co-ops. One of the first things you notice while driving from the Bilbao Airport towards the corporate headquarters in Arrasate-Mondragón is the countryside’s unspoiled beauty—rolling green hills uninterrupted by billboards and smooth roads untarnished by potholes. The town of 23,000 is solidly middle class. There are neither mansions on the hill nor poverty in the streets. We didn’t see wealth but everyone had a comfortable place to live, healthy food to eat and the comfort of modern conveniences. Equally noticeable was their convivial, even joyful sense of community. The people we met were friendly, conversational and trusting.